Are we talking a matter of days here? A couple of weeks? A September call-up? “According to sources close to organization, Trenton catcher Austin Romine, then Dellin Betances, will be next to board the SWB shuttle, with top overall prospect Jesus Montero expected to join the Yankees’ lineup in the very near future. As we head into the homestretch of Spring Training, many fans are wondering which of the Yankees highly touted prospects will make the team. My best guess is that only two will be on the Opening Day roster – and one won’t be the guy everyone seems to think. Here’s a quick run-down, beginning with pitchers and catchers. Pitchers – Coming into camp, there were six youngsters on the radar. All have demonstrated that they’ll be in the majors someday and a few have shown glimpses of top of the rotation talent. Dellin Betances: Headed to AA Trenton. Although he impressed at times, those moments were mostly in the early spring. As the competition began to stiffen, his lack of command and inexperience began to show. Don’t worry, though. He has all the tools to be an ace one day. My best guess is he gets a cup of coffee in 2012 and is a full time Yankee in 2013. Manny Banuelos: See above, although he’s shown more poise. He may actually fast track to the boogie down faster than Betances; he has better command of more pitches at this stage and he’s left-handed. Andrew Brackman: Remember how Randy Johnson frustrated the Expos early in his career, as his 6’10” frame got completely out of kilter with men on base? Brackman is at that stage now. He throws hard and has a wicked breaking ball, but his mechanics need a lot of fine tuning. He’s headed for AA Scranton, but we may see him in pinstripes sooner than the other Killer B’s. Ivan Nova: Yankee fans, meet your number 4 starter. It isn’t official yet, but he has proven himself capable this spring. He is combining a plus fastball with a “cut-slider” and improved change to make hitters look foolish at times. Adam Warren, David Phelps and D.J. Mitchell: All three are proving that they may be serviceable as middle of the rotation or relief type pitchers. A lot of teams would drool at this trio, but with the Yankees, they’re merely trade pieces. Catchers – Most teams have trouble finding one young catcher. The Yankees have 3 kids who are pushing for a MLB spot. The back-up spot on the Yankee roster will be open until early May with Francisco Cervelli’s injury. Which one goes north? Jesus Montero: The kid can hit, but his defense…well, no one is going to confuse him with Thurman Munson just yet. 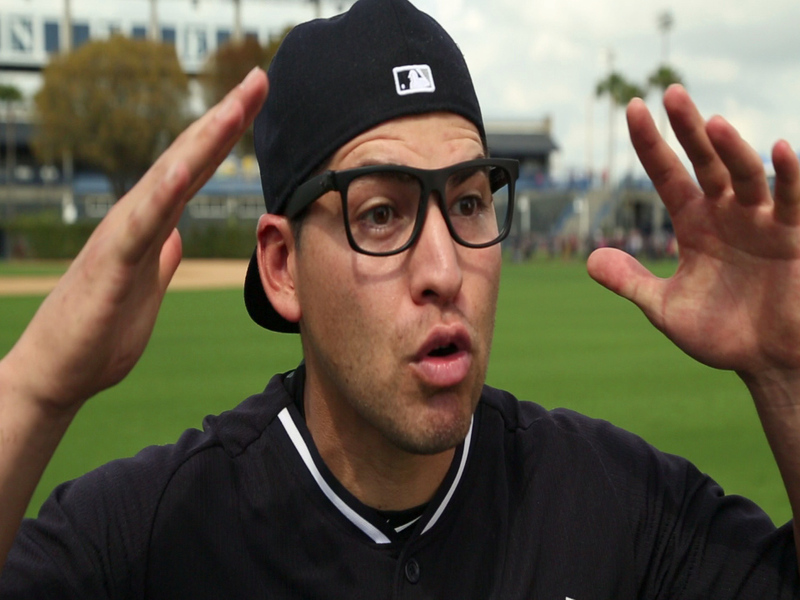 I really hope the Yanks send him back to AAA to start the year – to allow him to play every day and work on it. Catcher is still a defense-first position and having an all-offense catcher isn’t a luxury the team can afford. I suspect that the manager understands that, having been a catcher during his MLB career. Austin Romine: The most polished defensively of the trio, his odds of being the heir to Jorge Posada are pretty low. By bringing him north and letting him play 2-3 times a week, he can show off those skills and hopefully hit well enough that the Yanks can set him up as a big-time trade piece – or that he plays so well that Cervelli winds up on the trading block. He is good enough to start for about 20 teams right now, including a few with hopes of contending. Gary Sanchez: With only 47 pro games under his belt, the 18 year old is near the top of Baseball America‘s Top 100 prospect list. He is still at least two, and more likely four, years away from being ready for the majors. But if the scouts are right, this kid is the next coming of Johnny Bench. Coming tomorrow, I’ll look at the minor league infielders and outfielders trying to make the Opening day roster. The Yankees are prepared to start the season with a rotation that consists of two starters with limited or non-existent major-league experience, General Manager Brian Cashman says. With the Royals sending Zack Greinke to the Brewers and Cliff Lee signing with the Phillies over the Yankees, Cashman is not excited about the crop of pitchers available via trade or free agency. “I’m not saying I want to do it, but I may have to do it,” Cashman told ESPN.com of starting the season with a back-end of a rotation lacking experience. The three certainties in the rotation are CC Sabathia, Phil Hughes and A.J. Burnett. Cashman told the website he is not counting on a return from Andy Pettitte. “Could I go out and get a starter? Yes, I could. But there’s just not much out there,” said Cashman, who ruled out acquiring Cy Young winner Felix Hernandez from the Mariners. Ivan Nova, who went 1-2 with a 4.50 ERA in 10 appearances (seven starts) last season, is the obvious choice as the fourth starter. The top pitching prospects in the franchise are Manuel Banuelos and Dellin Betances, but both are expected to start the season in Double-A. Andrew Brackman could be the favorite for the fifth spot if Pettitte does not return. The Red Sox had their “bridge” year last year and finished in third. This year, the Beaneaters are intent on finishing first and went on a spending spree. They don’t appear to be done yet. One of my Boston friends actually said the Yankees could wind up in third this year. I laughed him off, saying there is no way Cashman and the Steinbrenners would allow any such thing to happen. But, after watching the way this off-season has unfolded: the highest profile signing being a catcher coming off hip surgery who now needs knee surgery, simultaneously holding back our best prospect; letting every decent pitcher available go elsewhere, not doing anything to shore up the bench – I’m beginning to become afraid. For those of you haven’t heard, Cliff Lee surprised just about everyone by deciding to sign with the Phillies. The move is an unqualified disaster for the Yankees and Brian Cashman, who had bet the farm (and the team’s immediate future) on signing the ace lefty. Combined with Boston’s wheeling and dealing, and Andy Pettitte’s possible (and likely) retirement, the Yanks may not be in serious contention for a playoff spot: Boston hasn’t only improved themselves, but so have the Tigers, Twins and White Sox. The Yankees look like they’re headed into the season with a two man rotation. (CC Sabathia and Phil Hughes), a depleted bench and shaky bullpen. Ouch. 1. Trade for for a starter: use some of the Yankees minor-league depth to acquire a proven, front-end starter. Unfortunately, two best rumored to be available, Zack Greinke and Carlos Zambrano, are both head cases. Greinke is a former Cy Young winner. He’s rumored to want out of Kansas City. He’s young. He’s also had problems handling stress – and suddenly being cast as the “savior” of the 2011 season for the New York Yankees has a good chance of stopping his 2011 season before it starts. Not too mention that KC would want half of the Yankees farm sytem in return. Zambrano has top of the rotation stuff and the “Big Z” certainly has delivered both wins and quality starts in the past. But he’s also the poster child for petulance – and does anyone really think Larry Rothschild wants to be reunited with the Cubs ace? 2. Promote Ivan Nova and Hector Noesi: the last time the team slotted two rookies into the rotation was in 2008. Enough said on that idea. Although it may be the only option left. 3. Sign Carl Pavano: stopped laughing yet? Remember, this is the same front office that sent a popular outfielder and LH relief prospect to bring in a past failure who would eat innings, coming off a good season. That didn’t work out so well, but Cashman may well be considering the idea. After all, none of us thought he’d bring back Javier Vazquez, either. 4. Put Joba Chamberlain back in the rotation: no matter how much they say otherwise, this team loves jerking the kid around. He’s been everything from Mo’s heir to doghouse sitter so far. As much as they’ve been saying that Joba is in the pen for 2011, no doubt the brass has to be seriously reconsidering that idea at the moment. 6. Stockpile relievers, realizing that half of the team’s innings need to come from the ‘pen: great idea, except free-agent relievers rarely work out as intended. The only high-upside reliever left on the market is Rafael Soriano and it’s hard to see the Yankees singing another closer. 7. Bring in a player personnel guy. Cashman has proven astute on the business side of baseball and made the Steinbrenner family a ton of money, so its no wonder they love the guy. But his personnel moves leave a lot to be desired. Its simply insane that the team with the highest payroll has holes, and this one now needs a 4th and 5th starter, a set-up reliever, a 4th outfielder and utility infielder. When you look at the players he’s brought in versus who he’s let go, well… that’s a whole other post. No real surprises on the list. Montero ranking #1 makes sense, considering he could very well be holding the starting catcher position out of Spring Training at the start of next season. As you can tell by the list, some prospects have made considerable improvements. Sanchez (#7 in ’10) and Brackman (#10 in ’10) have moved up the ranks. The thing that has to catch your eye is Dellin Betances ranking #3 on this list. It just shows how good of a year he’s had, considering he was left off the top 10 list all together in 2010. The even better news is that it dashes Hank Schulman of the San Francisco Chronicle’s hopes of putting Jeter into a Giants uniform. 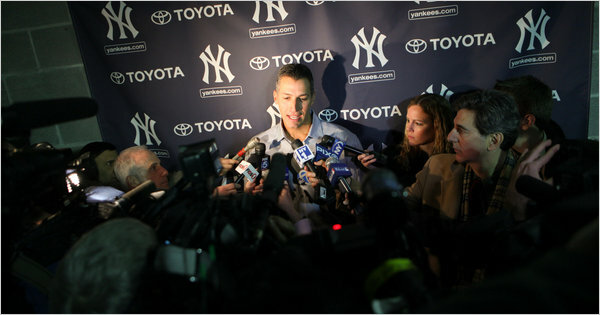 Item 3: Has anyone heard from Andy Pettitte? Not really – and the Yankees aren’t figuring to hear from Andy before Thanksgiving. Although I love Andy for what he’s done in the past and think he can still be an extremely effective pitcher in 2011, he is beginning to remind me of Brett Favre. As much as the Yankees would love to have Cliff Lee in pinstripes, if neither he nor Pettitte are around in 2011, the Yankees rotation looks to be paper thin. Pettitte is the key, since regardless of what happens with Lee, if he decides not to come back then the team is stuck with Ivan Nova or a journeyman (quick: how fast can you say Dustin Moseley?) in the 5 spot. Neither can be particularly enticing. Although I can say that possibility would give Joe Girardi’s binder a heck of a workout. Item 4: And finally, speaking of giving the Girardi Binder a workout, the pages would be burned out by May if Mariano Rivera doesn’t wear pinstripes in 2011. Fortunately, nobody really expects that to happen. But it does appear that Rivera’s contract has taken a back seat to those of Jeter and Pettitte, which has to give Yankee fans everywhere at least momentary heart palpitations. Dellin Betances and Manny Banuelos have both been promoted to Double-A Trenton. You remember I told you about that man who was trying to deliver a photo to President Barack Obama? Well, he completed his mission. Barack Obama gets a gift from Yogi Berra. “One man, standing at the edge of the yellow police tape, handed POTUS something (it looked like a maroon 8.5×11 folder but pool was too far away to tell.) POTUS looked at it, then handed it to Nicholson [Obama’s trip director],” read the report. So who was the man, and what was in the envelope? Turns out it was Tom Murro (a.k.a. the “Celebrity Magnet” from New Jersey) who had a gift for Obama from baseball legend Yogi Berra: a photo of the Brooklyn Dodgers’ Jackie Robinson coming in safe after stealing home during a 1955 World Series game against Berra and the Yankees. Berra wrote “Dear Mr. President, He was out!” and signed his name in blue pen. Here is the video. Attention Yankees Fans. You now have the chance to own a baseball signed by C.C. Sabathia, Alex Rodriguez, Bucky Dent and Joe Torre! They’ve all signed baseballs to be a part of our SUBWAY Baseball DeSIGNS tour, a collection of baseballs decorated by Little Leaguers and signed by professional athletes and celebrities. The 40-baseball display has been making tour stops across the country and is currently set up at the Little League Baseball World Series in Williamsport, PA. The baseballs are also viewable at SubwayKids.com and the Official SUBWAY® Facebook page.